The only way that there can be a fair and impartial hearing is if the FBI first conducts its investigation and presents its findings to the Senate Judiciary Committee. Trump was just being his normal delirious self when he said today that the FBI is not interested in this investigation. Evidently the FBI picks and chooses what it feels like investigating, as long as it doesn’t interrupt their tea and crumpets. GEZUZ, Trump regurgitates some really stupid comments. Christine Blasey Ford is entitled to be heard and her allegations fully vetted by the FBI, including all witnesses, and a full investigation into the threats against her and her family. We have a Russian operative who was put into the White House and is masquerading as the President of the United States. He is illegally in office. 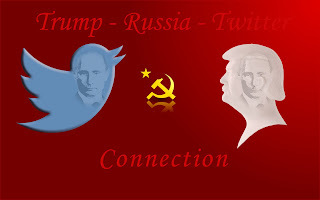 He and his corrupt attorneys are using legal maneuvering to facilitate the agenda of the hyper-wealthy and Russia, in order to conceal the truth and allow the corruption to continue. These criminals are attempting to use the legal system to shield them from any accountability. 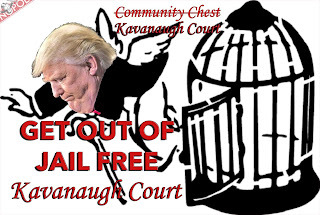 With respect to the Kavanaugh confirmation, trump and his complicit GOP legislators are using partisan majority and authority in a very corrupt manner to confirm an individual to the Supreme Court who is decidedly Trump’s Get Out of Jail Free Card, and the opinions spoken and written by Kavanaugh prove this. Mr. Kavanaugh has already committed perjury numerous times before the Senate. Some might question, is there really any Rule of Law left. If the Senate does not call for a full FBI investigation, which can be ordered by Chuck Grassley, and confirms Kavanaugh, then the Rule of Law is nonexistent.